1. "Easy Lift Handles" - Side wall mounted handles helps the firefighter to pick up the liner when closing the tank. Grab handle kits are also available for existing tanks. 2. Heavy Duty Floor Design - When ordering a 22 oz. Vinyl or HPR tank you can get an optional 30 oz. floor at no extra charge. Specify when ordering. 3. Quick Release Drains (a-d). - Placed on the inside of the tank so water pressure will seal off the drain sleeve. With pull strap for emptying the tank. More streamed lined for better traffic flow. HPR is a formulated fabric made specifically for Fol-Da-Tank Company with proprietary rights. Unlike other company's that put a fancy trademark name on an existing fabric. Fol-Da-Tank has tested the New HPR fabric in the cold climates of Alaska to the extreme hot desert of the Middle East for over 5 years. HPR (High Performance Rubber) has been designed with UV, heat and puncture resistance, along with abrasion and cold cracking (-60 degrees F) qualities. 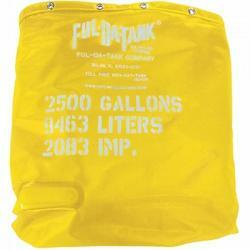 Fol-Da-Tank Company guarantees this fabric with a "LIFETIME WARRANTY" on the hot air or R.F. 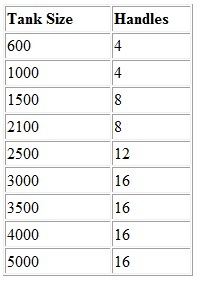 (Dielectric Radio Frequency) heat sealed seams! The HPR formulation allows Fol-Da-Tank to offer the best fabric on the market today. HPR is used in our standard folding frame tanks, our flexible pillow style tanks, self-supporting onion style tanks and secondary containment berms. The possiblities are endless! 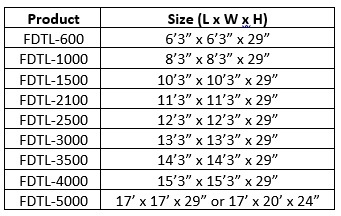 When choosing the superior liner fabric Fol-Da-Tank Company offers the versatile HPR fabric for all your liquid containment needs!